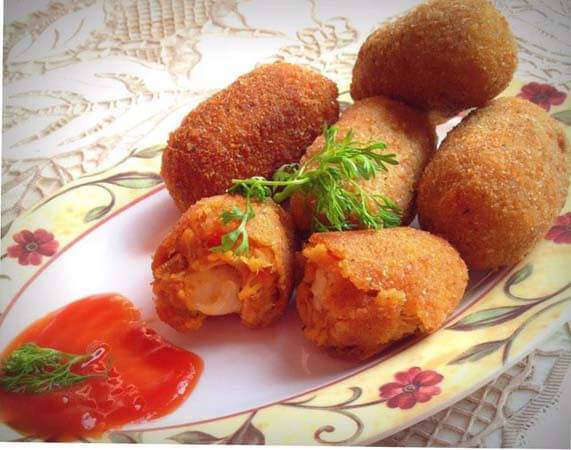 Try out lip smacking Spicy Chicken & Cheese Croquettes, a perfect snack for your Iftar time and tea time. 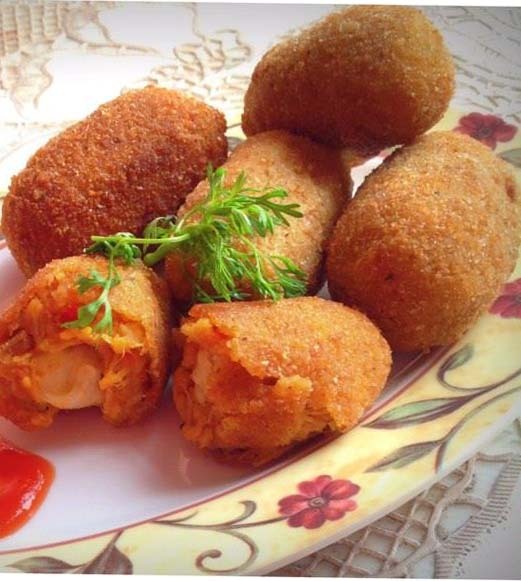 The taste of Croquettes is heavenly delicious. Also check out some other yumm for your kids Fish fingers, Chicken popcorn and tender pops. Cut the chicken into small pieces. Add 1 tsp salt and 1 tsp ginger garlic paste. Boil the chicken in a pressure cooker on medium heat until three whistles. After boiling, reserve the chicken stock for later use. Finely shred the chicken using your hands or a wooden spoon. Keep aside. Simultaneously, boil the potatoes with the skin on for 10-15 minutes until it is completely boiled. Peel off the skin. It will come off easily after it is completely boiled. Mash the potatoes using a masher and keep aside. Heat oil in a wok. Add the onions. Fry until brown and translucent. Add the ginger garlic paste and chili paste, and saute for a couple of minutes. Add the tomatoes with the salt, red chili powder, coriander powder, tandoori masala and paprika. Cook until the mixture thickens. Add the chicken stock and cook for a few minutes. Now add the chicken and potatoes. mix well until everything is well incorporated. Cook for another couple of minutes. Spread the mixture on a flat dish and leave to cool. Pinch out about 40 balls from the mixture, spread ball mixture on your palm and stuff with the grated cheese and shape into croquettes. Freeze at least for an hour before frying. Before frying the croquettes, beat an egg with a pinch of salt and black pepper powder. Dip the croquettes into the egg wash, cover in breadcrumb and fry on medium heat for 2-3 minutes or until golden brown. 1- It can be kept frozen for up to 2 weeks. 2- While freezing the croquettes, sift a layer of cornflour or all-purpose flour onto the croquettes so that they don't stick together.